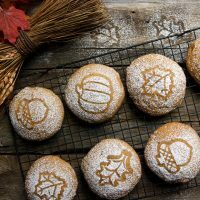 Soft and fluffy pumpkin cookies, with the Fall flavours of cinnamon and ginger. Best served warm from the oven dusted with icing sugar. Line a baking sheets with parchment paper. and preheat oven to 350 F.
In a large bowl, whisk together the flour, baking soda, baking powder, salt, cinnamon, ginger, nutmeg, and cloves. Set aside. In a large bowl with an electric mixer or in the bowl of a stand mixer fitted with the paddle attachment, beat the butter with the white and brown sugars until light and fluffy, 2-3 minutes. Scrape down the bowl, then beat in the eggs one at a time. Stir in the vanilla and pumpkin puree. Scrape down the bowl, then mix in the flour mixture on low speed until well combined. Using an ice-cream scoop or a large tablespoon, scoop dough in to mounds, placing several inches apart, as these will spread. You will probably get 6-8 per baking sheet. Cover and refrigerate remaining dough, while the first batch cooks. If using turbinado sugar, sprinkle on cookies before baking. Bake for about 20 minutes, or until puffed and very slightly browned around the edges. Remove from the oven and let rest for a few minutes on the baking sheet, before transferring to a cooling rack to cool. If desired, dust with icing sugar before eating. Repeat with remaining dough, or leave refrigerated and cook as needed. Note that dough cold from the refrigerator may need an extra minute or two of baking time. These cookies are best enjoyed warm out of the oven, or on the same day they are baked. They do freeze well.